SACRAMENTO, Calif. (CN) – In the clash between the Trump administration and California over immigration laws, a federal judge on Thursday upheld a signature piece of California’s policy requiring law enforcement to limit cooperation with federal immigration agents. 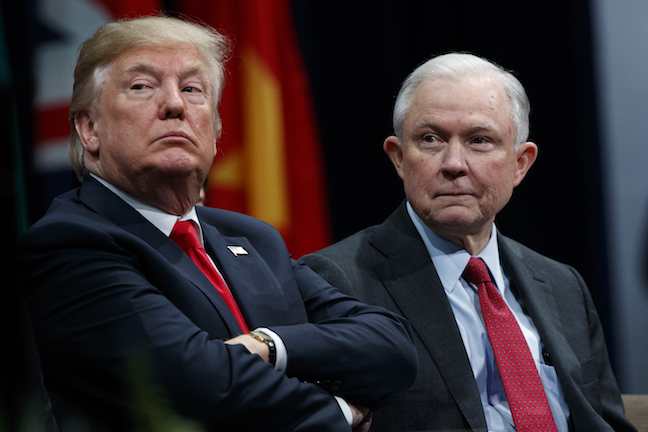 In a case flush with states’ rights implications, a federal judge denied the federal government’s motion to preliminarily freeze Senate Bill 54, a bill often referred to as the Sanctuary State Law. U.S. Attorney General Jeff Sessions claims the 2017 bill and two others were created specifically to impede and delay federal immigration operations in the Golden State. He sued the state in March seeking to gut the policies. Mendez upheld SB 54 and AB 103, which requires inspections of state detention facilities that contract with the U.S. Immigration and Customs Enforcement. He did however halt sections of Assembly Bill 450 which bars California employers from allowing ICE to inspect their property without a warrant. The ruling comes two weeks after a nearly six-hour hearing on the Trump administration’s motion for preliminary injunction in downtown Sacramento. Attorneys for the federal government said the trio of pro-immigration laws signed by Gov. Jerry Brown, a Democrat, violate the Supremacy Clause of the U.S. Constitution. More than a dozen Republican-led states submitted briefs in favor the lawsuit. In his order, Mendez cautioned that “long-term” solutions to the country’s immigration crisis won’t come from “piecemeal opinions” from federal judges. He urged the administration and Congress to move past partisan politics and come up with a legislative fix. “Our nation deserves it. Our Constitution demands it,” he concluded. In a statement Thursday afternoon, Gov. Brown also called on the legislative and executive branches to address the issue. The ruling is a critical victory for Gov. Brown and the state’s Democratic leadership, who dubbed the three laws the California Values Act. State Democrats have accused the president of pushing a racist agenda and of fear mongering. California Attorney General Xavier Becerra has sued the federal government 36 times since Trump took office in January 2017. Sessions ventured to Sacramento in March to drum up support for the lawsuit, just one day after suing Brown and Becerra. He ripped the recently passed laws and promised ICE would continue deporting undocumented Californians in a 21-minute speech. In court, Sessions’ attorneys said federal immigration policy pre-empts each of the laws and accused California of interfering with public safety. They painted the Sanctuary State Law as a “blanket policy” intended to melt ICE operations. California countered that the laws were crafted in concert with federal laws and that they do allow for cooperation with ICE, just under specific scenarios. For example, state and local law enforcement agents can turn over detainees that have committed violent crimes and employers can allow ICE onto their property as long as the agents get a court order. The judge acknowledged the difficulty in determining a balance between the “twin powers of California and the United States,” but largely sided with the Golden State. “This court finds that AB 103, SB 54 and the employee notice provision of AB 450 are permissible exercises of California’s sovereign power,” the order states. Becerra lauded the ruling in a statement Thursday afternoon. “Today the federal court issued a strong ruling against federal government overreach in USA v. CA. The Constitution gives the people of California, not the Trump administration, the power to decide how we will provide for our public safety and general welfare. California’s laws work in concert—not conflict—with federal law,” the state attorney general said. The federal government is expected to appeal Thursday’s ruling, a point Justice Department spokesman Devin O’Malley all but confirmed in a statement. “When they passed SB 54, AB 103, and AB 450, California’s political leadership clearly intended to obstruct federal immigration authorities in their state. The preliminary injunction of AB 450 is a major victory for private employers in California who are no longer prevented from cooperating with legitimate enforcement of our nation’s immigration laws. While we are disappointed that California’s other laws designed to protect criminal aliens were not yet halted, the Justice Department will continue to seek out and fight unjust policies that threaten public safety,” O’Malley said. Mendez, born in Oakland, played baseball at Stanford University in the 1970s before graduating from Harvard Law School. Prior to the federal bench, he was a Sacramento Superior Court Judge from 2001 to 2008. During oral arguments, the judge said he was aware of the high probability that his decision would be appealed to the Ninth Circuit and potentially the U.S. Supreme Court. He promised the parties a comprehensive written record, devoid of partisan politics. “We’re the first stop, it will wind through the courts,” Mendez said last month.